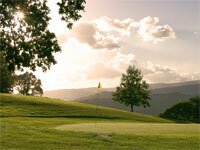 Since its opening in 1993 Woodlake has gained the reputation as one of the best inland courses in Wales. A major part of their success is the quality of the greens which were constructed in accordance with standards laid down by the United States Golf Association. The putting surface alone attracts golfers from far and near. The attention to detail is observed throughout the course with views of the Brecon Beacons and the Black Mountains.